I’ve been reading a few of these each week and love the format for random thoughts (and I have many). So, I’m going to give it a go. If we were having coffee, it might be at my kitchen table. 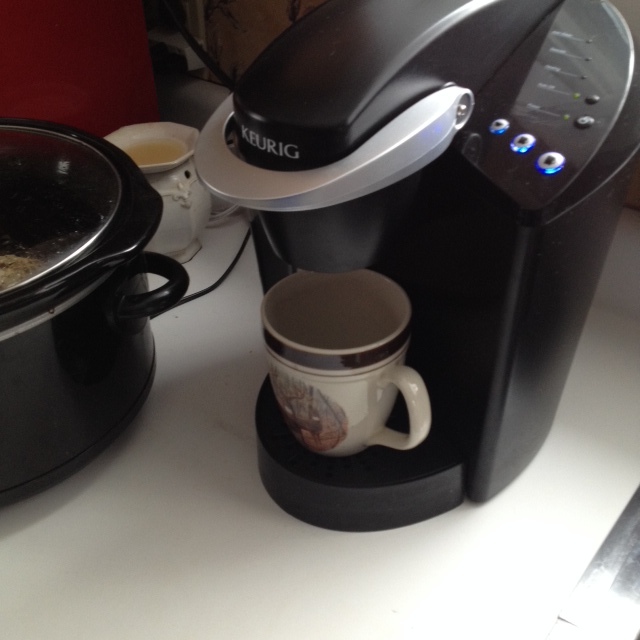 I’d offer you a number of choices because we have had a Keurig since Christmas and I think I’m a barista now. Today is a breakfast blend for me with hazelnut creamer. Not a fancy brand, just the local supermarket brand and it was on sale. We are quickly finding out k-cups are not cheap. I’d also offer you a donut. We picked some up last night for half price on the way home from seeing a movie, the first time my wife and I have been out together without kids in months. I would tell you I had a short weekend last week because I had to travel on a Sunday to work in Texas for three days. I would rather not travel on a Sunday but it was required that I be there first thing Monday morning. It worked out well for me because I wanted to make it home by Thursday, my wife’s birthday. With my luck traveling as of late, along with weather surprises we have had in the Northeast, I knew there was a risk but it all worked out perfectly. If we were having coffee, I would tell you about the short story I wrote in my head while sitting in the airplane. Although my writing is going painfully slow on my novel and I should be putting all my effort into that, I decided to take a break and write another short story. I just have to run with it. If we were having coffee, I would tell you how I am praying my son did well in his scholarship competition yesterday. We were on the road at six in the morning and made the two and half hour drive to a college he was accepted to so he and a hundred plus other students could compete for one of ten full tuition scholarships being awarded. The college has already offered him a nice scholarship but a full tuition scholarship, and a renewable one at that, would be so financially comforting to me and my wife. At worst, the college would give each participant $1500 just for trying. Fifteen minutes of his time will either be worth $1500 or $14,000. Either way, he is a winner in my eyes. If we were having coffee, I would tell you how upset I was yesterday evening watching the news. When I travel, I tend to watch too much news in my hotel room because I don’t like flipping channels to see what is on. I’ve become spoiled having a menu of all the shows and their times on TV. All through the week the media kept updating us on the fact there was no real update concerning the fate of two remaining hostages being held by terrorists in the Middle East. Yesterday came the sad news that a second hostage from Japan had been killed. If we were having coffee, I would tell you that there are two things I seldom talk about outside my family circle: religion and politics. Yet here I am today still wondering what kind of man or woman who claims to be a follower of any God or prophet can kill so indiscriminately in the name of religion whether it is now, or hundreds and hundreds of years ago. I would question how any government, regardless of political or religious ideology, can sit on the sidelines while atrocities like this exist in our world. As we sip our coffee in the comfort of my kitchen, I would silently give thanks. Thanks that I still believe good trumps evil and will prevail in the end. Thanks that there is still something beautiful on this planet worth saving. Thanks that despite the darkness that envelopes us at times we can still find light. As always, I am consistently amazed by your writing. I always get a sense that even the simplest or seemingly so pieces are part of a larger whole–and that might also be true of your sentence constructions and word choices. There is a sort of chromatic progression and a cohesive theme that seem to underpin everything I read from you–which makes me think of both music and machines at the same time. I recommend reading Zen and the Art of Motorcycle Maintenance. It’s not a perfect explanation, and I have always felt there’s a bit of misogyny mixed in. However, his exploration of the classic versus the romantic point of view is, for the most part, excellent. I am so glad you have decided to join in with these! I actually saw it on the #SundayBlogShare (you may have noticed me doing the guest host thing over there) but the #WeekendCoffeeShare is my sister’s project. So yay! Haven’t looked at the list to see if you added your post to the linkup, but if not, you are certainly welcome to do that! I’ve been reading them from time to time each week. Love the format, love the flexibility. I did notice you guest hosting! Busy day. Thank you for reading and commenting Gene! I’m glad you joined us for #weekendcoffeeshare this week and I hope you keep coming back. I thought this was an awesome post! I hope your son did well enough to get that scholarship but I know that even if he didn’t, he IS still a winner. I’m glad you can see that! I hope your week is a good one and I’ll look forward to seeing you here again next week! Thank you Corina. I enjoy reading them and thought I would try the format. As for the full tuition, we will find out within the next week. They only invited about one hundred and twenty incoming freshmen so the odds are pretty good. A Keurig is one of my must-haves in 2015, but for now it’s regular old coffee for me when I don’t wander to a coffee shop here in town! Thank you! We’ve always enjoyed regular old coffee too, either out of a standard coffee maker or a percolator type (while camping). In the past, we’ve experimented a little with grinding our own beans, buying an espresso machine (broke it), and a French Press. Both my wife and I have Keurig machines where we work and loved the coffee choices so we decided to buy ourselves one for Christmas. Excellent post, Bill! I love this and how you throw little tidbits of your thoughts out, without going into depth. Thanks Dena! I could have written an entire post on how upset I was about the news. I think I’ve just had enough of it at times. I quite watching the news and reading the paper. Just sadness and chaos all the time. I know that doesn’t make it all go away and maybe turning a blind eye is the wrong thing to do, but like you, it wears on me and I become overwhelmed. Thanks for a post as warm as shared coffee and as tasty as hazelnut creamer. Best to your son and happy birthday to your wife! Keep writing — even coffee posts ad to our bigger works. Thanks Charli. I’ve really enjoyed some of the coffee posts I’ve read and yes, all add to the big picture. I felt like I was actually with you sharing a cup of coffee ( me drinking Tea! lol) There was a warmth to this post, like close friends chatting 🙂 Best wishes to your son! He is a winner, no matter what! And belated birthday wishes to your wife! Thank you Anjali. We enjoy our tea too. My son has been the one to lead that movement.